In a large University many of the roles required to support Researchers in their work are spread across a variety of services. As each service has their own focus and strengths they are able to assist at the point in the research process most appropriate to their skills. What happens when there is a need to develop new skills, update existing ones or increase awareness of new requirements that impact all these services? How do you identify who needs to know what or who needs to know about what other areas are doing? 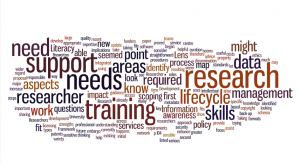 While it may at first seem quite straightforward to identify the major areas where training might be required, where does this fit in with the research lifecycle and who therefore will need to have a greater awareness or expertise in specific areas? What skills do the researchers need and at what point? Does this impact on what training is required? 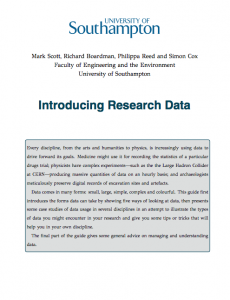 These are the questions that I have been taking time to consider with regard to research data management and how through training we can enhance our network of support. There seems to be two key aspects to the training support teams. The first is to look at what they already know, what areas they are responsible for and what they are currently doing to help the researcher? The second is to look at what support the researcher needs, at the what point in the research lifecycle and who will provide this? Having looked at this it seemed that it was important to be able to map these aspects in some way. 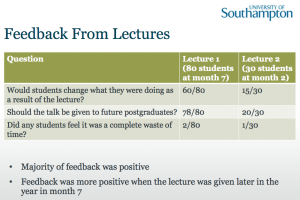 There has been a lot of recent work looking at the needs of the Researcher resulting in the Research Development Framework, and the Information Literacy Lens based on it, that very much show the researcher at the centre of the process, as they should be. It seemed sensible to take this approach in the initial scoping of the training needs and see where the skills fit in the research lifecycle. 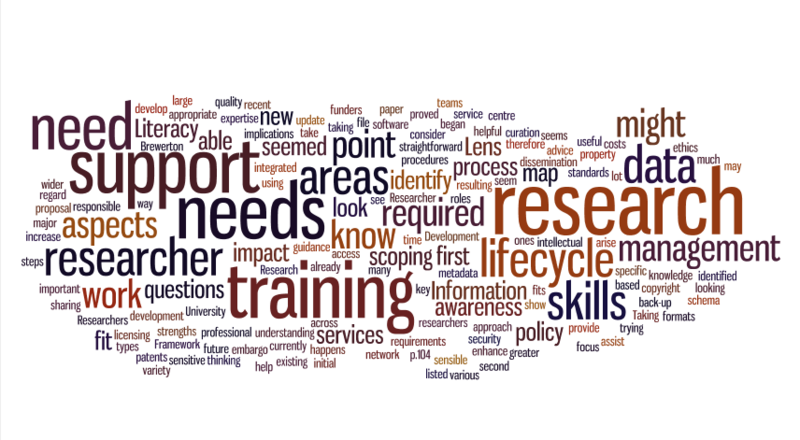 Taking the research lifecycle steps listed in Brewerton (2012, p.104) and using some of the aspects of knowledge understanding identified in the Information Literacy Lens, work began on trying to map the advice, guidance and support the researcher might need. This proved useful in breaking down the various types of questions that might arise and scoping for the future. It was also helpful in thinking through the wider implications of data management on policy and procedures, how data fits in with other professional development and the need for integrated support. The DataPool Training Matrixv1 is the result of this work. There are empty boxes where you might expect content because it was covered elsewhere and we didn’t want to repeat. There are probably still skills that could be included, but we have learned what we needed to for our current purposes. It is still, to a lesser extent, a work in progress, and we would welcome comments.